The Let's Face it Friday Challenge this week was to create a project featuring handmade flowers and our PKS faces, of course. I wanted to create a bunny in the carrot patch so I brought out my trusty Tear Bear Face Parts set which I think I use the most. I love the eyes and noses in this set! Jump on over to the challenge site HERE to check out the other great projects that the DT members cooked up. If you have a PKS face set, play along in the challenge for a chance to win the 1 1/8" Happy Lashes and Dolly Dumplin face sets. Cut the bottoms off medium ovals for feet. Sponge the edges of inside ear pieces with Regal Rose ink. Stamp the eyes with Black Staz On ink. Stamp the nose with Regal Rose ink. Draw line under nose with zig pen. Stipple regal rose ink into cheeks. Glue feet onto back of body. Glue ear pieces together and glue to back of head. Attach head to body with dimensional. Attach paws to body with dimensionals. Die cut 2 strips of grass using the MFT grass die (use both pieces from the cut). Die cut one in Certainly Celery and the other in Old Olive. Cut a piece of Chocolate Chip cardstock 1" x 2 1/2". Cut 4 sides off snowflake piece and trim to create carrot tops. Sponge edges of pink pirouette pieces with regal rose ink. Sponge pieces of baja breeze with Marina Mist ink. Sponge pieces of daffodil with More Mustard ink. Sponge edges of pumpkin pieces with Cajun Craze ink. Sponge edges of garden green pieces with garden green ink. Sponge edges of certainly celery and old olive pieces with Garden Green ink. Tear top of chocolate chip piece to look like a patch of dirt. Sponge edges with Early Espresso ink. 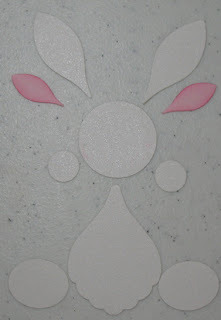 Layer the flower pieces with liquid glue. Attach a self adhesive pearl or rhinestone in the center of each flower. Glue tops on carrots. Put one carrot in the bunny's paws. Glue the other 3 carrots onto the back of the dirt heap piece. Glue a celery grass piece onto the front of an olive grass piece. Create 2 sections of grass. 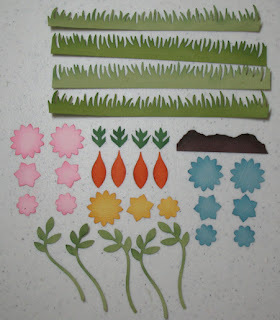 On the back section of grass, glue the branch pieces onto the back for the flower stems and trim away excess. Baja Breeze card stock 6" x 8 1/2" card base folded in half. Attach front to card base. Glue back grass section to front of card about 1/2" from bottom of card. Attach flower heads to stems with dimensionals. Attach bunny with dimensionals. Attach front section of grass in front of bunny with dimensionals. Attach dirt patch on top with dimensionals. Stamp greeting from "Bring on the Cake" with marina mist ink on shimmery white card stock. Punch out with Modern Label punch. 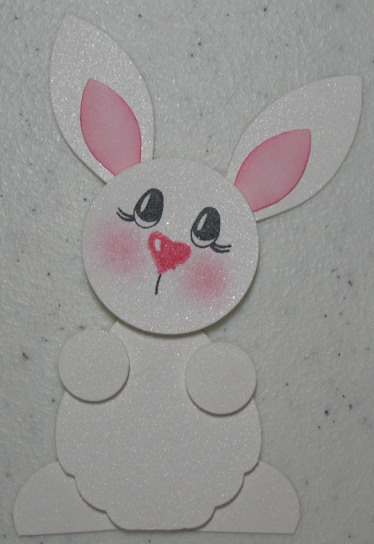 Cut off left edge of label and glue to card. Attach a jewel brad. I really love this punch art... he will definitely be on my Easter cards this year. thanks for sharing as usual your creations are out of this world! Thanks, I found a place to order one. I have loved that die cut but didn't know where to get one. This is adorable! I love the shimmer paper! Thanks for sharing the details on how to recreate it! Il est trop mignon ce lapin!!! This card is so cute. Maybe one of my favorites! Thanks for sharing! Love getting your daily emails!! 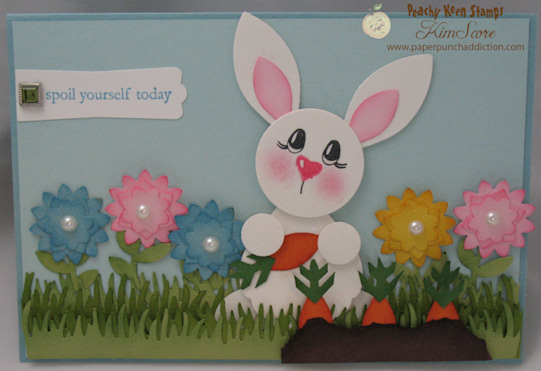 Thanks for sharing this bunny punch art card. It's so cute! You always have the greatest punch art ideas! I'm always looking for new ideas for cards for my grandkids. Now I must put this face set on my list for Peachy Keen Stamps! Hugs!! Oh my! This bunny is just AMAZING! I LOVE how you always see things thru different! You have to have one of the most creative minds EVER! As always Thank you for always inspiring us! This card is adorable! I just love it! Thank you for sharing. Now I need to get busy and get my Peachy Keen faces back out again. Thanks for so many great ideas.